Maisie and I are at the intersection of Champa and 17th Avenue in downtown Denver and we are both a little shell-shocked by the traffic and the noise and the people and the commotion. Maisie is a well-traveled dog — Colorado is the 19th state she has visited — and I am no rube, having been born in East Harlem and lived in New York, Boston, and Seattle, among other cities. But there is no question that life in our town of 9500 people, in the middle of rural Iowa, bears little to no resemblance to this booming metropolis sitting at the edge of the Rocky Mountains. I tried to prepare Maisie for her first stay in a downtown hotel the weeks leading up to our trip. We took fewer walks out on the trail and up to the meadow, took more walks into our own “downtown” — the quintessential town square that exists in just about every small town in Iowa. I wanted her to get more comfortable around cars and traffic, get used to stopping and waiting at intersections, increase the likelihood that we might encounter another dog on a leash. I wanted to prepare her for the marked difference she was going to experience in Denver. But as we stand at the intersection of Champa and 17th, I realize how ill prepared I am for being back in a city. Never mind the fact that we live in a small and generally peaceful town or that I spend most of my days working at home with few interactions with other humans. That would be enough of a contrast. But Denver, the gateway to the Front Range, is also the bridge between the burgeoning Rocky Mountains to the west and the desolate Colorado High Plains to the east. I am convinced that I-76, the highway that diagonally slices the nearly treeless plains of the northeastern corner of Colorado, might be one of the loneliest sections of interstate in this country. Small towns — population 25 kind of small — dot the region along the way, towns with names like Cope and Last Chance, but they are nowhere to be seen from the vantage point of the highway. Denver and its environs, really, are kind of a shocking jolt to the system. The first time I drove west across the prairies, when I decided to pack my entire life into my Subaru wagon and go live in the mountains a couple of decades ago, the massive, seemingly-impenetrable wall that is the Rocky Mountains silenced me with awe — my breath, my mind, my heart, all seeming to stop for a brief moment as I contemplated these peaks rising 13, 14 thousand feet above the sea level from which I came. I couldn’t imagine what the early settlers must have thought upon first seeing this massive mountain range, after so many miles, so many countless days and weeks on the Great Plains in wagons pulled by horses, long before Denver was the exploding urban scene it now is, long before I-70 would carry so many travelers across the mountains with such relative ease. But it was a grey, rainy day when my husband and Maisie and I drove across the High Plains and it was long after sunset when we pulled into Denver this time, and so all I was met with was, well, just another big city, with skyscrapers and billboards, heavy traffic (even on a Sunday night) and neon lights. Maisie sat in the back seat, her paws up on the armrest, taking it all in. She was quiet and alert and was intensely observing all she could through the rain spotted window. I couldn’t help but wonder what she thought of all of this chaos — getting in the car normally means a trip to the dog park for her — so I spoke for her, as I’m often wont to do. “That was a ridiculously long drive and that sure as hell is not a dog park,” I said. Without the snow-capped peaks in the distance, Denver is just another big city. My husband and I are camping out in Denver for the week and so we began unloading the van, a task with which I will never be quite comfortable, despite how frequently we do it. There are guitars and amps and a P.A. and other gear, my piano and my violin. There are our suitcases and Maisie’s bed and her own overnight bag (full of treats and a toy or two, her food and dishes) plus a cooler full of healthy food for us and our own pillows because, yes, I’m a little high maintenance in the eating and sleeping departments. The luggage cart is always piled precariously high, rendering itself a high-class twin of the supermarket cart with a bum wheel. It is always at least three trips. And I always feel horribly, shamefully self-conscious. Like we must look like the Beverly Hillbillies in and amongst the business travelers with their small, single suitcase and matching briefcase, their sleek, clickity clackity high heels and polished loafers laughing at my clunky but oh-so-comfy-Uggs. All our gear looks SO much better in a venue than piled high on a luggage cart. My husband is a good man, though, and he volunteers to take care of it all so I can take Maisie for a pee-walk. At this point, the uncharacteristic rain is coming down quite steadily and I can tell Maisie is a little on the anxious side. We wander around the blocks near the hotel but there is nothing but concrete. Even the tree wells have steel grates over them. I have never seen Maisie pee on anything other than grass, and I can feel her stress level (okay, my stress level) rising. After a few blocks, I give up and take her back to the hotel. My husband continues with the unloading while I feed her and then go down to the front desk to inquire about a patch of grass where my dog might pee. I am informed by the front desk that there is an area in the parking garage just for dogs, covered with woodchips and out of the rain. I know it isn’t the same thing as a park, but figure it will do in a pinch. I retrieve Maisie (who was none too comfortable in the elevator) and we make our way to the 6th level of the parking garage —which is deserted and dark and makes me feel like I am in the scene of a thriller, the kind of scene that makes me leave the room because all I can think is DON’T HURT THE DOG. I eventually find the dog relief station, a sandbox-like structure there in the corner, tucked away from anyone who might witness any malfeasance towards us — which, incidentally, was not out of the rain. But she won’t go in it. I try to lead her in, but she refuses and I can’t say I blame her. Evidence of all the thoughtless dog owners who had used it prior but apparently felt no need to pick up after their dog is everywhere in this oversized dog litter box. So it is back to the room, but now she is a shaking, wet, overwhelmed mess in an elevator full of people. When I see how many people are in the elevator as we are getting on, I pick her up, and she just leans into me, like she is trying to crawl inside of me, leans with every sinew, muscle, and bone, every soaking wet part of her being. My Maisie, who is normally so friendly and so ready to take on the whole world is terrified. And she still has not peed. Back in the hotel room, I reevaluate the situation. Now that the hillbilly move-in is over, now that the van is parked and we are all in one place again, I find a map of the city and learn that there is a small park one block past where we walked earlier and we set out again. The rain has become a gentle mist and she seems happy to see grass. She pees, she poops, I sigh with relief, and we head back to the hotel. The next day, when the rain has transformed itself into a gentle mist and we head out on our first city adventure, she is so curious, taking in everything: the people, the cars, the other dogs (the other dogs! ), the smells, the sounds. She has found sheer delight in the things left on concrete sidewalks: pizza crusts and bits of muffins and, much to my consternation, cigarette butts (why Maisie, why?). She walks with determination and purpose, not seeming to be fazed one bit that she needs to weave in and out of all the feet with which she is sharing the sidewalk — the business shoes and cowboy boots and high heels (oh my lord, the heels these women wear!). I struggle to maintain the pace we normally keep, when we are out unencumbered on the trail, when there is no one blocking our way, because I am not small and agile enough to weave the way she does. She reminds me of Joe Morris, the 5’7” running back who played for the New York Giants back in the 80s, the way she finds the pockets and the holes and makes her way through the crowd, caring not one whit for anyone who might be in her way. I am just trying desperately not to be rude and pushy. Finding some nature in the middle of the city: the South Platte River. But when we hit an intersection, when I say “WHOA,” she stops instantly, somehow knowing that she needs to listen, to really and truly listen, to me. Her tiny rear-end drops immediately to the ground. She holds still in a perfect sit, not moving a muscle. She doesn’t flinch when the traffic goes flying by, when the shadow of the city busses loom threateningly over us as they pass. When other pedestrians cross against the light, I just say “stay” and she looks up at me, waiting for her cue, waiting for the “okay” that lets her know we can cross. Waiting so patiently and so perfectly for the signal to continue on her mission to take in as much of the city as she possibly can. All that training is coming very much in handy in the busy downtown hubbub. Maisie was exceptionally well-behaved. And so begins Maisie’s introduction to city living. Like so many things about this little dog, she amazes me with how completely she adapts to the situation. After her first little bit of nervousness in the new space, she makes herself completely at home (see the featured photo!). All of the training we have done, all of the ways in which I have learned to connect with her, now serve us both in good stead. While most people ignore us — we are, after all, just another person walking another dog in another city — occasionally someone comments on how well behaved she is, what a good dog she is, what a cute dog she is. And I can’t help but smile with pride at my little Maisie Monster, at how far she has come in her travels with us, at how so very much easier it is to be in a strange hotel room in a too-big city with this perfect, little rescued mutt by my side. So dear readers, what are your experiences traveling to new places with your pets? If you leave them home, how do you manage to feel at home when you are away from home and away from them? I love hearing your thoughts, so please feel free to leave them in the comment section below! Needing a repository for all of the ramblings and musings inspired by rescuing Maisie, a pint-sized mutt with a gallon-sized personality, I started Barks at Strangers, a weekly bi-monthly whenever-I-can-squeeze-in-some-time blog dedicated to all the ways in which our non-human companions teach us about ourselves, inspire us to be better humans, make us laugh and make us cry, but mostly, show us how to open up our wounded hearts and let a little more light in. 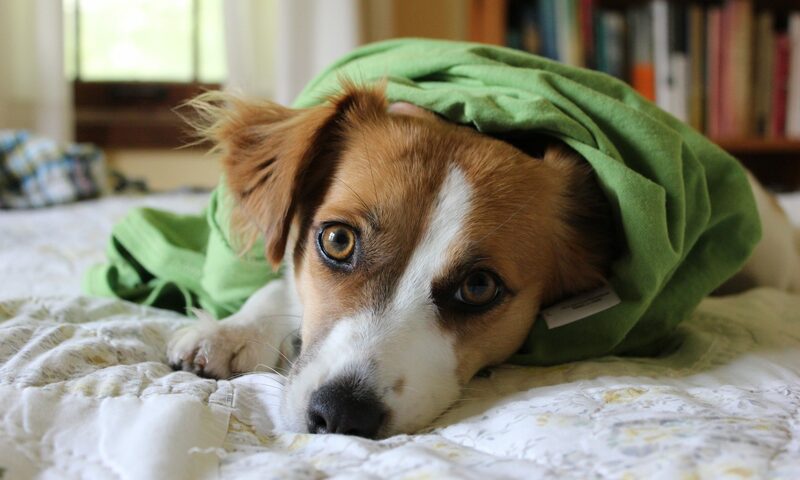 Maisie, a 17 pound Corgi-Spaniel-Terrior (our best guess) mutt, channels her instructions on life through her somewhat misguided, often leash-reactive, sometimes barks-at-strangers but ultimately kind-hearted human companion (that would be me). She fired her little soul into my heart with her unwavering and intense gaze my first day volunteering at the shelter and now she lives with me and another less-than-perfect human, sometimes referred to as “Daddy”. My name is Lauryn Shapter and I live with Maisie and my beautiful husband in a small town in rural Iowa. I love to write…songs and poetry, short fiction and creative non-fiction. I sing. I garden (or attempt to garden). I walk Maisie, a lot. My main gig is to write, record, and play music with my husband in a little band called Society of Broken Souls. Maisie is our road manager and though she truthfully gets very little done, she does offer her ears and her belly at the end of the night in whatever hotel in whichever town we may find ourselves in. Thanks for visiting and for sharing, if you are so inspired; I’d love to hear from you. Maisie has her leash on. Shall we go for a walk together?